SweetZone Watermelon Rings. 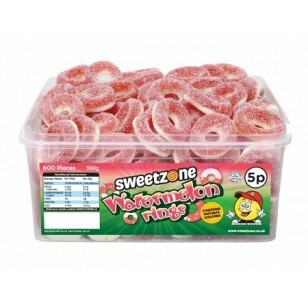 Fruit Flavour Gums - Made with 100% Halal Gelatine. Ingredients: Glucose Syrup, Sugar, Corn Starch, Beef Gelatine (halal), Acidulants (Citric Acid), Apple Juice from Concentrate (1%), Flavourings, Colours (E162, E163, E171). Contents: 120 Pieces. All the gelatine is derived from animals slaughtered according to islamic rights in Turkey, where the sweets are also made. All our sweets have a long shelf life.